Business for Healthcare Providers Is Your Practice At Risk Because Of Billing Issues? 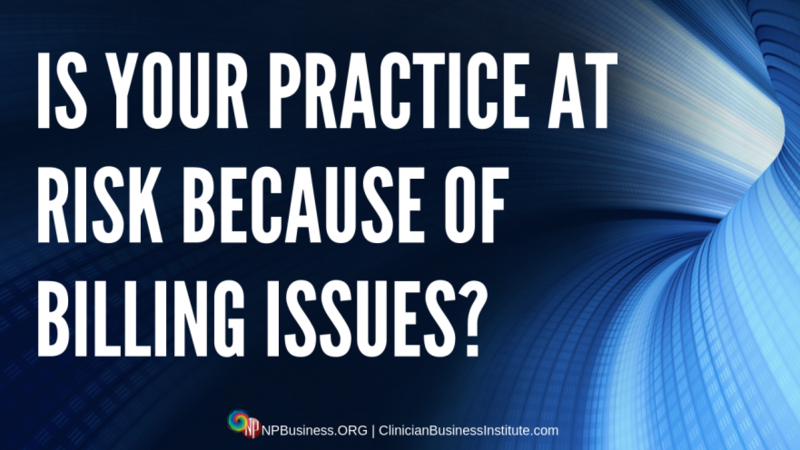 There’s been a recurring theme… the health of practices at risk because of billing issues. Some practices struggle to stay afloat; some even have to close their doors. But it’s not for the typical reasons, like insurance not reimbursing or patients not paying their part. No, this is different. What’s going on here is individuals or companies hired to do the billing, don’t do their job. Either they don’t bill, bill incorrectly, or don’t follow up. And by the time practice owners realize what’s going on, the damage is done. In all cases the result is the same… they don’t get paid, and cash flow suffers. But there’s some good news, and it is this… this doesn’t have to happen to you. If you understand the billing process and know what to look for, your chances of getting caught in a “billing nightmare” are much smaller. Granted, it will take time to get up to speed on your part. You need to educate yourself; you must know what needs to happen with your billing. It’s far too important to leave to chance. In addition to billing problems, many APRNs have trouble with credentialing. Again, this does not have to be this way. While tedious, credentialing is not difficult. Anyone can learn how to do it within a short amount of time. Take a few minutes and watch the video below. Find out more about potential billing and credentialing problems, and what you can do about it.